We finally heard it Sunday morning around 7 AM. The Great Horned Owl was calling to its mate and its mate was calling back. Jeff (my husband) said that he had heard one a few weeks ago and was diligent about getting outside on our deck early on the weekend mornings waiting to hear it again. Thankfully with the Binox-HD day/night time binoculars that I got him for his birthday he was able to locate to of them. They were up on a high voltage tower that sits about a hundred yards from our house on the other side of our pond. One was sitting on the very top and the other was on a cross cable below it. The pair were making alternating calls to each other that sounds like a deep, soft hoot that goes something like this, hoo-hoo-hoo-hoo. The Great Horned Owl is a nocturnal owl and is a year round resident where we live in Kentucky but also throughout North America and also in Central and South America. This owl can be anywhere from 18 inches to 24 inches with wingspans 39 to 57 inches. The female is ten to twenty percent larger than the male but the male has a larger and deeper voice than the female. This is the owl that has tufts and large eyes and can swivel its head up to 180 degrees. It is a pretty intimidating bird especially when you see one sitting so high up looking down on you with its fierce looking eyes and strong talons. Did you know that Great Horned Owls mate for life? In October you will hear them calling as they begin to set up their territories. The male does a courtship display where he loudly calls to the female and the female responds back to him. This is what we heard last Sunday. The owls continued to call back and forth for about twenty minutes then flew away. However, a few minutes later we could heard them calling once again a short distance away. They continued to call for another ten minutes or so. Then they moved again and did the same thing all over again. Once it started getting light we couldn’t hear them anymore. 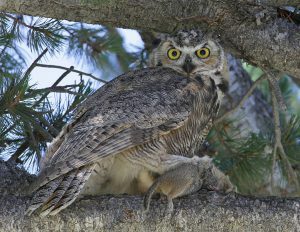 Great Horned Owls start to nest in late December, January, and February. 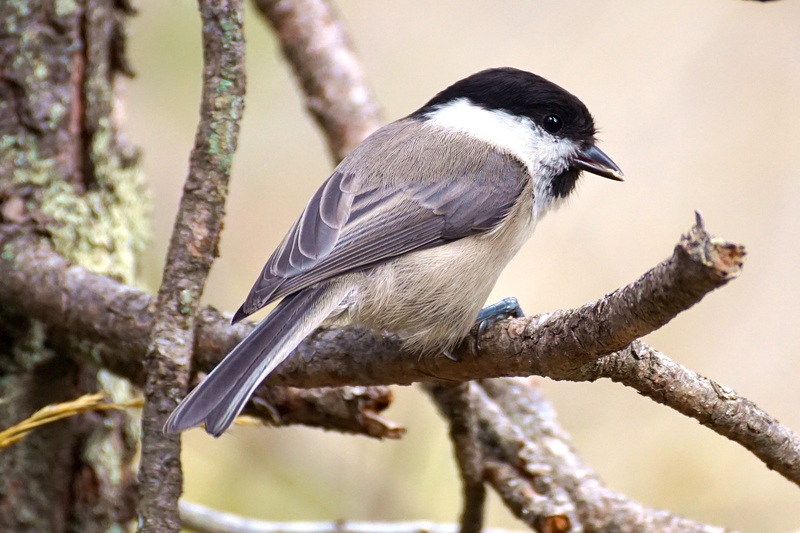 They use the nests of other birds such as hawks, crows, or herons and also squirrel nests, hollows in trees, or artificial platforms. At the county park close to where I used to live in Ohio, they put a big nesting bucket in a sycamore tree and the Great Horned Owls came to nest there every year for a couple of years. 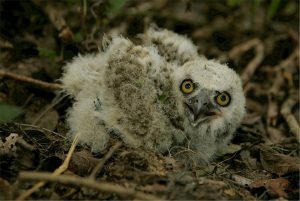 It takes about a month or so before eggs begin to hatch and then about six more weeks after that before the babies leave the nest. This is the period when we would drive by the nesting bucket looking for the little fur babies popping up out of the nest. We were also lucky enough one year to have a pair set up their nest in a sycamore across the road from our house. That was a lot of fun watching the adults throughout the nesting period and seeing the young. WHERE CAN YOU FIND GREAT HORNED OWLS? 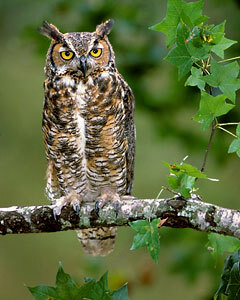 You may see Great Horned Owls in woodlands, swamps, orchards, open fields, city parks, and in suburban areas like ours. They feed at dusk and at early dawn. Their diet consists of birds, mammals such as rabbits, skunks, hawks, voles, moles, shrews, rats, gophers, chipmunks, squirrels, woodchucks, marmots, prairie dogs, bats, skunks, porcupines, ducks, loons, mergansers, grebes, rails, owls, hawks, crows, ravens, doves, starlings, house cats, and small dogs (like my little Millie…YIKES!). So if the habitat where you live consists of any of these birds and/or mammals a Great Horned Owl may be present. It’s October and a great time to hear the Great Horned Owls calling. That’s the big owl around 22 inches long that has tufts and big yellow piercing eyes. You might hear one or two hooting outside your window at dusk or at dawn. They make a call that comes through loud and clear and one you cannot mistake. These owls are calling now because it is time to set up their territories and get ready for nesting which is around late December, January, or February. Look for them high up in a tree, on top of a telephone pole, or even a high voltage tower where we saw them. It is always a treat to hear one and even better when you see them. So keep your ears and eyes open. If you want to learn more about the Great Horned Owl this book has in depth information about them and illustrations. Have you heard the Great Horned Owl yet? Feel free to share your experiences in the comment section below. Posted in Backyard Birds, Owls, Raptors Birds of Prey.